Five strangers find themselves trapped when a elevator mysteriously goes into inspection mode. Time passes while security and maintenance try to troubleshoot how to get the passengers out, but once one of five trapped inside is attacked, a series of events leads everyone involved believing something else is in the elevator with them. "Devil" could be construed as a ingenious scare tactic into religion. The horror directed by John Erick Dowdle goes out of its way to clarify with the viewer that the horror is rooted in a religious pretense. Unlike most horror films the killer is not a masked psychopath out for revenge or a haunted spirit consumed by rage. Instead the killer is the devil himself. Using brief appearances to make examples out of human beings who have not walked a spiritual path. Tell that story to children when they go to bed each night and they are sure to say their prayers an also sure to end up in your bed. While "Devil" could be construed as a scare tactic into religion, its not. The film is however a well paced ride that does a fairly good job of keeping the viewer stimulated but never scared. The thriller spends chunks of time trapped in a very small space, although the film failed to capture a true sense of panic or terror within the contained area. While the film is inventive in its ways of getting the story outside of the elevator, I thought the real panic and fret was lost by removing the viewer from that contained space so many times. "Devil" is never actually scary. It has some creepy moments and does give a few chills, but the film never really sets in a true level of paranoia or fear as it should have. Despite not being scary, "Devil" does remain engaging while watching it. The film, much like playing the old board game Clue, keeps the viewer guessing. The 5 characters within the elevator each give off reasons for doubt or reason to raise an eyebrow and playing along with the who-done-it angle is involving. It doesn't help that each of the characters and their developments are borderline boring, not to mention predictable. Each character is given a flaw and deciphering those flaws is all too easy. That said, much of the character flaws and predictability can be forgiven because the journey is sprinkled with enough to keep your attention. I've really got nothing in praise to say about the cast. The entire group blends in extremely well as everyday characters, which is always a positive, but much of the portrayals are grating and never become characters you are compelled or engaged in. It is very odd that the story and its actions are engaging but the players within it are the opposite. Re-cast this film with another group of capable actors and it might be a home run, but as it stands now with this cast, it is just a forgettable movie. Some mention to M. Night Shyamalan must be made. 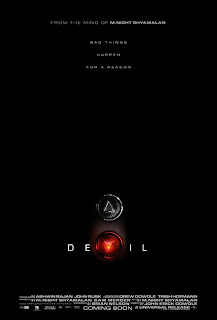 The film is marketed as a Shyamalan movie and whether you view that as a good or bad thing, "Devil" does feel like a story imagined by M. Night. How much is open to debate. When you see 'Devil' there are numerous themes and plot devices that you'd have to be blind not to notice as Shyamalan inspired, but overall the film does not feel like he directed it. Granted Shyamalan produced it and he has his name all over it but, director John Erick Dowdle and screenwriter Brian Nelson deserve credit for their work. For a contained movie, 'Devil' has some great camera work. Cinematographer Tak Fujimoto is stuck with four walls and five faces to capture repeatedly however he and director John Erick Dowdle do a polished job of presenting some varying and intriguing angles. Especially love the work done in the prologue and epilogue that hammers home the religious sentiment the the horror has. Fernando Velázquez deserves a mention for his score feels heavily borrowed from Hans Zimmer's recent "Inception" score, but does add a level of tension to the 80 minute film. "Devil" is hardly a great movie but it deserves your attention for a couple of reasons. One, it is a fresh take on a killer/possession horror movie. In a genre of film where sequels and franchises have always dominated, it is exciting to see a more original concept on screen. Two, it is quick and painless with just enough fright to keep you engaged and entertained. The movie might suffer from weak performances, but overall it has just enough to keep your undivided attention all the way through. 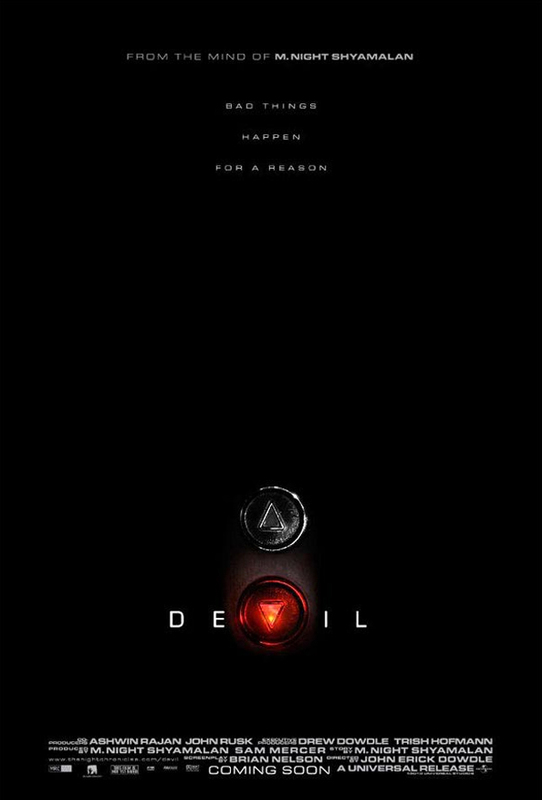 Finally while 'Devil' does enough to keep your attention throughout the film, its lasting effect is lacking.